This painting used for the Cover was provided by: Ms Conni VanBilliard. Drawn to all aspects of the arts from an early age, Conni VanBillard has been inspired to capture feelings and impressions of life experiences through poetry, creative writing, music, and dance. She began working as a professional actress and singer while still a teenager. Although Ms. VanBillard took general art classes in Junior High and High School, she did not begin to paint until after college. Following a period of experimentation with various mediums, she began to explore the use of common household items, such as waxed paper, cloth, tape, and rubber bands instead of brushes. She has often used her hands, arms, and feet to paint. In recent years, Ms VanBillard has begun to focus on the use of items from nature such as leaves, seaweed, grasses, and rocks. Using a unique mixture of printing and focused direction, she creates intriguing abstracts signifying feelings, the beauty of nature, and personal expression. Ms VanBillard currently resides in Southern California. I have known Conni since she was a small child. I was a friend of her father, Arne (Red) VanBillard. He died in 1996. We miss him. 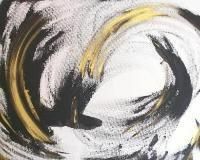 This painting is titled, The Black Hole. She painted this beautiful work of art while feeling that loss. She may be reached at; artbyconni.com.